The SELECT program offers a variety of bedroom storage pieces to easily create a customized, well-organized bedroom. This large dresser features nine spacious drawers to easily store clothes, linens, and textiles. Simple round hardware and bracket feet complete the clean, casual style. Solid rubberwood construction ensures sturdy, long-lasting support. Available in 36 paints and stains, as well as specialty aged finishes. The SELECT Bedroom 9-Drawer Dresser by John Thomas at Furniture Barn in the Pennsville, Bear, Newark, Hockessin, Middletown, New Castle, Townsend, Talleyville, Wilmington, Marshallton, Smyrna, Elkton, area. Product availability may vary. Contact us for the most current availability on this product. Case Construction All products are constructed from solid parawood/rubberwood. Select pieces are crafted from pine. Convert your bedroom into a stylish, organized space with the SELECT program. Offering a wide range of bedroom storage pieces and several bed options, the SELECT program allows you to customize by mixing and matching pieces for the style you desire. Not only are these pieces versatile, but they are left unfinished for you to choose your own color palette! 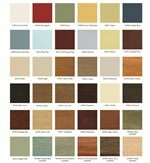 The SELECT program offers 36 paint and stain options, as well as specialty aged finishes, for you to design a fun, fresh coordination of hues to fill your home. Create a fresh, breezy bedroom with a Blue wash finish accented with White washed trim. Go sophisticated formal in your master bedroom with a Black and Cinnamon combination. The options are endless. With the SELECT program, your style + your color = your way! The SELECT Bedroom collection is a great option if you are looking for Casual Mission furniture in the Pennsville, Bear, Newark, Hockessin, Middletown, New Castle, Townsend, Talleyville, Wilmington, Marshallton, Smyrna, Elkton, area. Browse other items in the SELECT Bedroom collection from Furniture Barn in the Pennsville, Bear, Newark, Hockessin, Middletown, New Castle, Townsend, Talleyville, Wilmington, Marshallton, Smyrna, Elkton, area.